Double stitched at the end. Western Spur Here is a western spur with just the right encouragement. Made of high quality stainless steel with brass buttons. Both Ladies and men's spur will have a 1 3/4 inch neck. Size: Ladies or Men's. 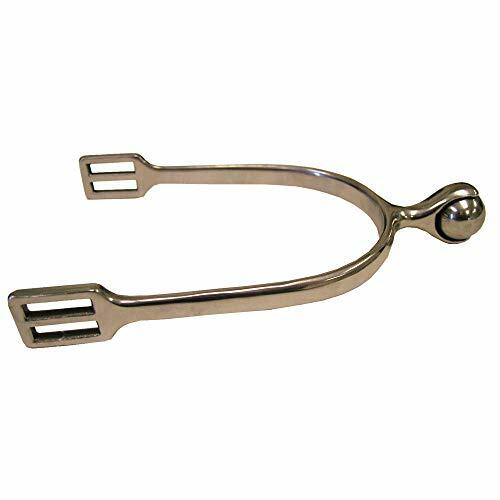 These chrome plated spurs have a 1-1/4" shank, a 1/2" wide engraved band and a 10 point rowel. Children's size. 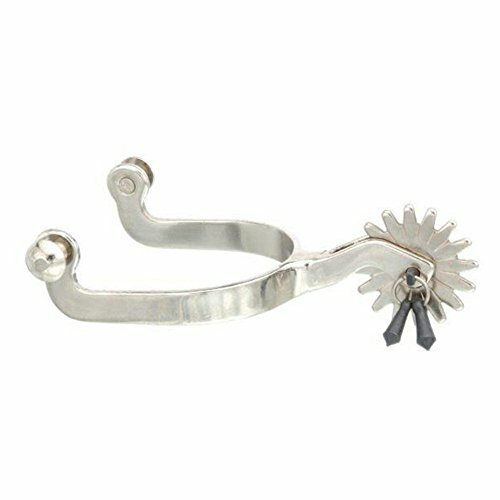 Featuring a .5-inch band with jingle bobs, the Kelly Silver Star Jingle Bob Spurs - Chrome Plated come with a 16-point rowel. High-quality chrome plating adds to its style and durability. High-quality chrome-plated spur. Features .5 in. band with jingle bobs. Comes with a 16-point rowel. 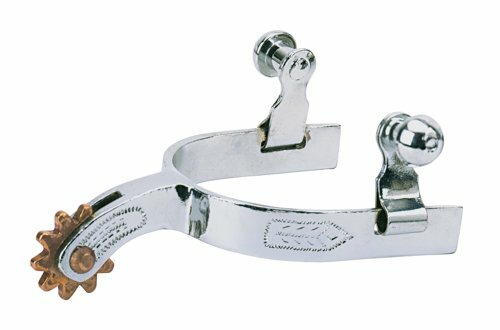 These chrome plated all purpose spurs feature a 1-3/4" shank, a 1/2" wide band and a 10 point rowel. Men's size. 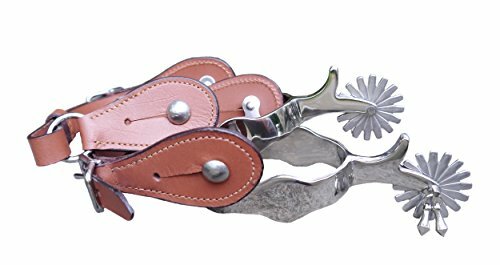 Set of antique brown western style show spurs. Hand engraved silver overlay with crossed pistols motif, silver star on buttons. Jingle bobs and chap guard. Men's size. 3" opening, 3 1 4" deep. Band: 1 1 4" shaped brown steel with hand engraved silver overlay Shank: 2 1 4" with jingle bob and chap guard Rowels: 2 1 4" 10pt. 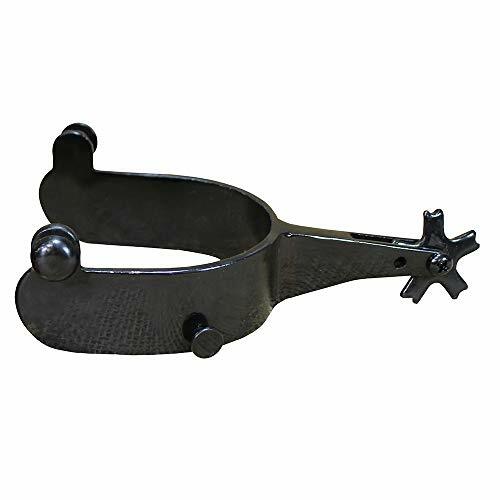 Pair of antique brown western style show spurs. Hand engraved silver overlay with crossed pistols motif, silver star on buttons. Jingle bobs and chap guard. Rowels: 2 1 4 10pt. Men's size. 3 opening, 3 1 4 deep. 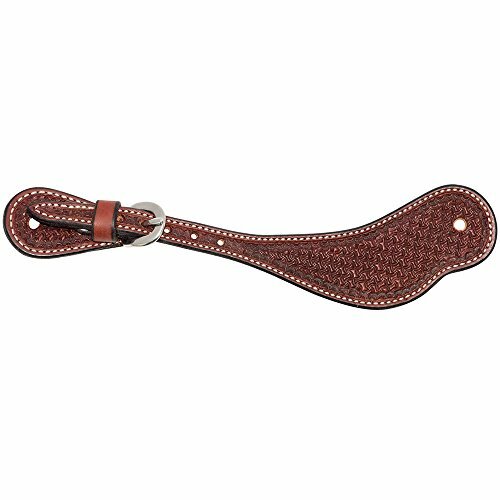 Soft Touch English Spur with Roller Ball - English Spur This Soft Touch spur is great for those well trained or sensitive horses that just need a subtle cue. 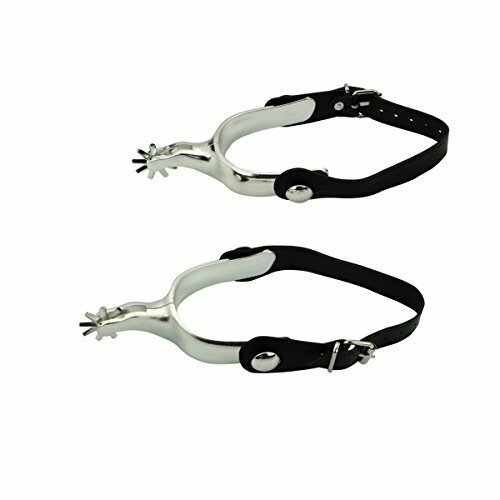 Just roll the ball on your horse's side softly and with the light contact that these spurs provide, your horse will be performing at his best. Quality Coronet Stainless Steel. Gents. 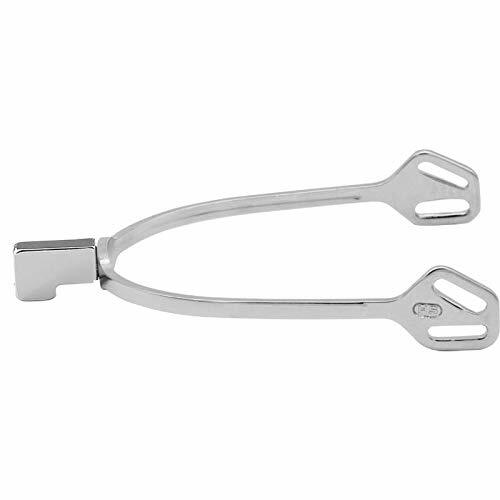 These stainless steel spurs feature a 1-3/4" shank, a 1/2" wide band and a 10 point rowel. Ladies' size. These are great Spaghetti Western designed cowboy boot spurs. Very similar to the boot spurs Clint Eastwood wore in: "A FISTFUL OF DOLLARS", "A FEW DOLLARS MORE", and "THE GOOD, THE BAD, and THE UGLY". 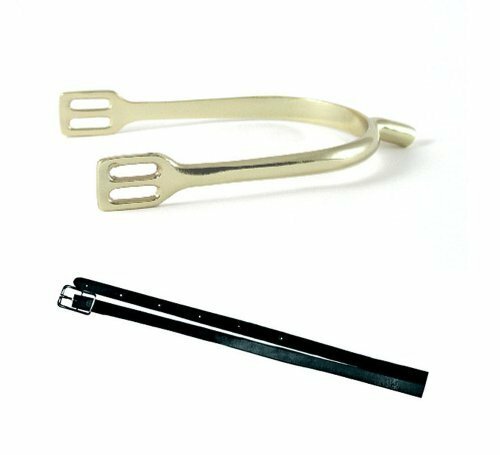 These high-end stainless steel spurs come as a pair with the leather straps attached. They jingle when you walk ... "JUST LIKE IN THE MOVIES !!!" You are looking at a gorgeous pair of leather spur straps made by hilason. 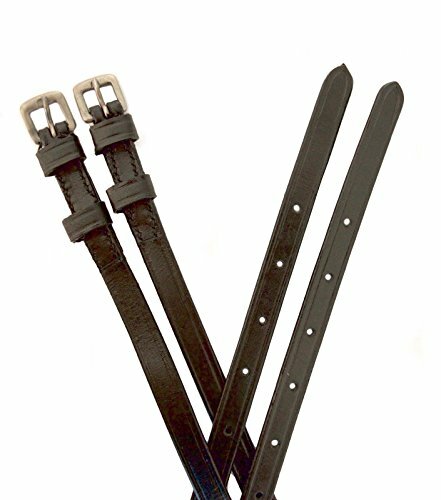 These straps have been made with genuine high quality leather with hand dyed edges. The hardware used is solid stainless steel. MATERIAL : High Quality Genuine Leather. For those who have earned their combat spurs in the U.S. Cavalry! This brass plated steel spur fits snug on you boot and sleek profile stays out of your way and is highly desired by Cav Troopers. Spurs and straps are new and packaged in poly-bags. Each bag comes with one pair of brass spurs and one pair of black leather spur straps. 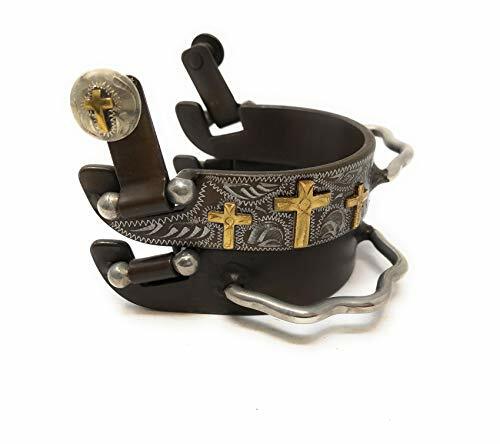 Pair of brown steel humane bumper show spurs with three gold cross and etched silver design, small gold cross on buttons. Gentle on horse, easy on and off. Hold it right there, partner! 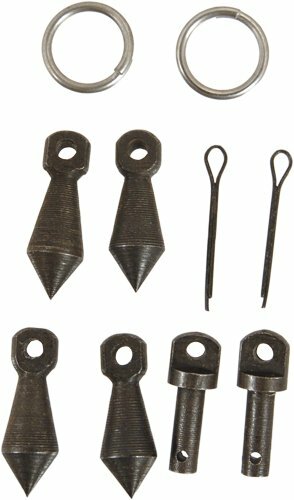 These adult adjustable deluxe cowboy steampunk lightweight boot spurs are a great accessory to your cowboy Halloween costume or steampunk look. 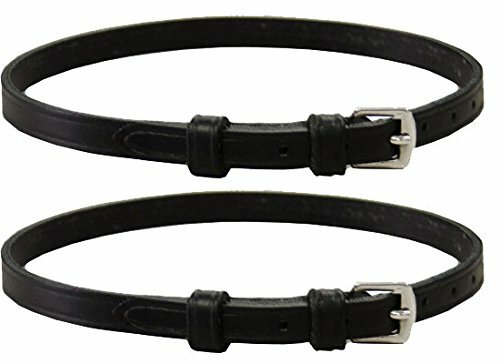 Measuring 6" long and 4" wide, the spurs can easily be adjusted by the attached black leather strap. 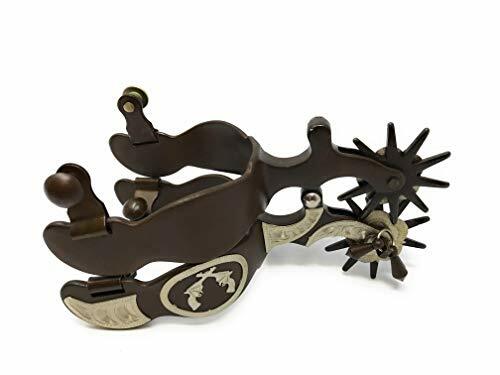 Strapping these deluxe cowboy spurs onto your boots will add a new dimension to your cowboy Halloween costume or your steampunk outfit and will have everyone talking. 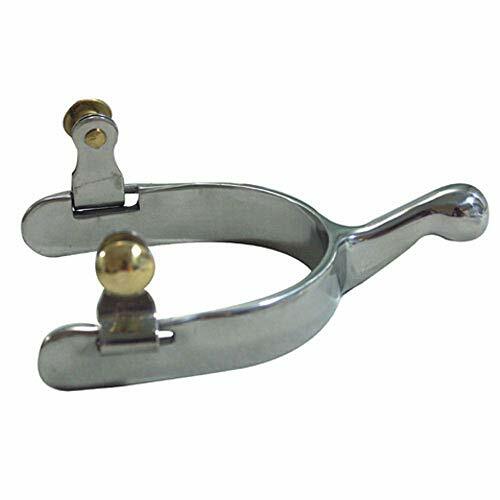 Made from a lightweight, durable polymer finished to resemble metal, spurs are easily attached to your shoes or boots. 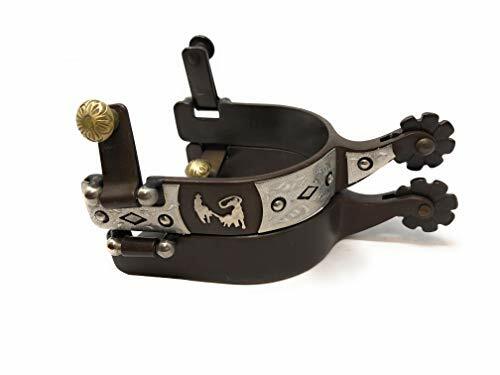 Pair of antique brown color show spurs, hand engraved silver overlay with team roping motif, decorated with silver dots and diamond shaped cutout. Comes with new pins, keepers, rings, and bobs. Will outfit one set of spurs. Showman Youth Size Leather Spur Straps w/Rainbow Unicorn Overlay & Rhinestones! New! 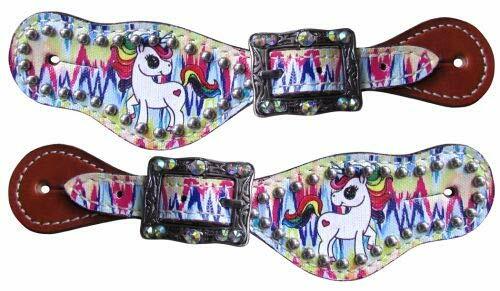 Showman Youth Rainbow Unicorn spur straps. These spur straps feature medium oil leather with a rainbow unicorn overlay accented with silver studs and brushed nickel engraved buckles with iridescent crystal rhinestones. Adjusts 8"-9". 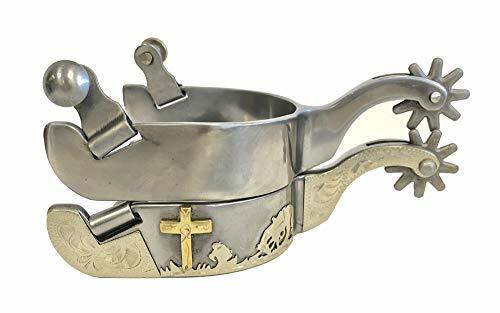 Pair of sweet iron cowboy show spurs, hand engraved silver overlay with praying cowboy and cross motif. 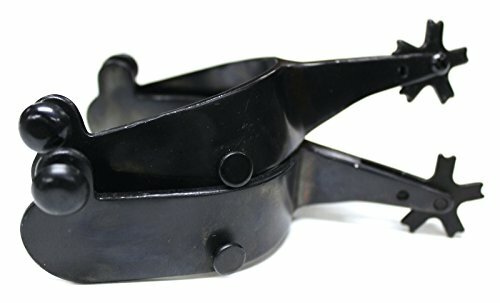 This is Hilason Black 30D offset horse riding spurs pair. 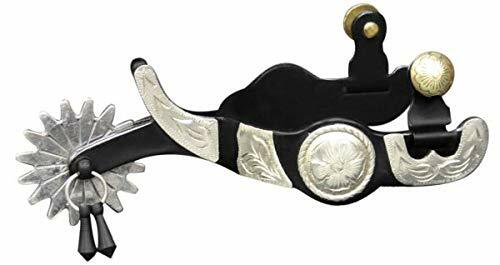 Showman Black Steel Jingle Bob Spurs w/Silver Engraved Accents! New Horse TACK! 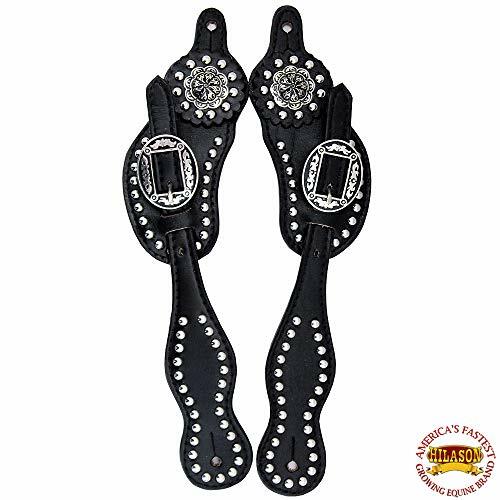 Showman Black Steel Jingle Bob Spurs. Features engraved silver accents and concho overlays. Brass buttons. 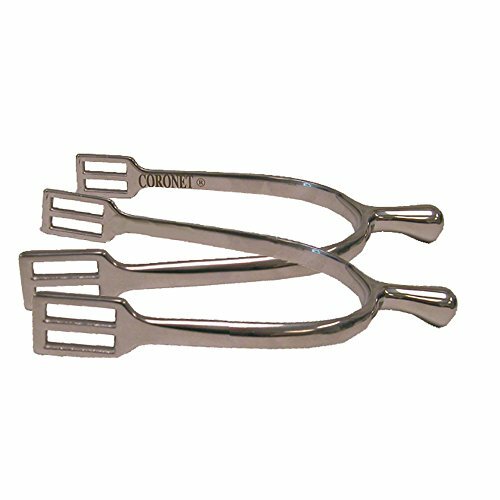 3" boot width, 1 1/4" band width, 2" shank with 1 3/4" in diameter silver rowel. SOLD IN PAIRS. 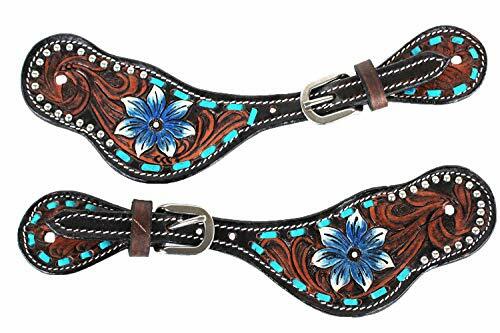 Showman Youth Floral Tooled Medium Oil Leather Spur Straps w/Turquoise Stones! New Horse TACK! 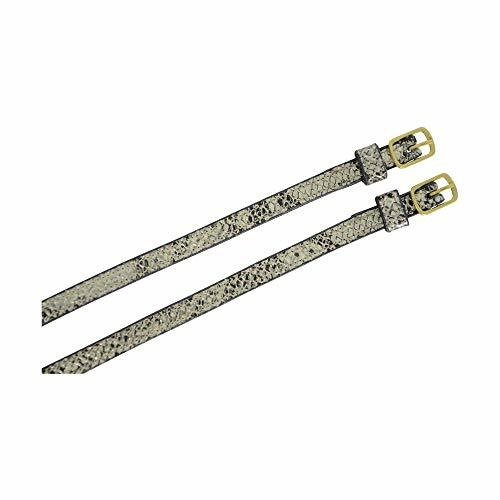 Showman Youth floral tooled spur straps.These spur straps feature medium oil leather with floral tooling and large tooled flowers on each end. Accented with engraved vintage copper buckles with turquoise stones. Add that dash of opulence to your competition outfit and stand out from the rest. 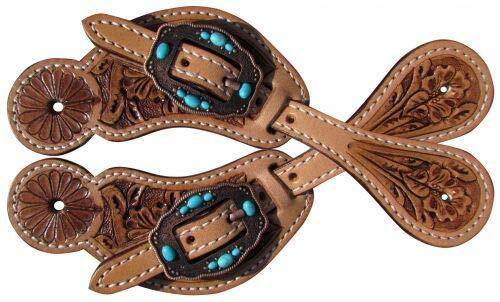 Showman Ladies Dark Brown Leather Spur Straps w/Hand Painted Turquoise Arrow Design! New Horse TACK! Showman Ladies Hand painted arrow design spur straps. 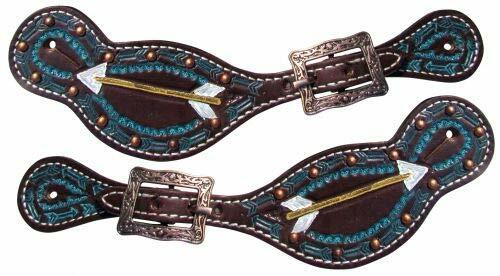 These spur straps feature dark brown leather with turquoise arrow tooling and a hand painted gold and white arrow. Accented with engraved copper buckles and copper studs.